WELCOME TO ROYAL FAMILY HOTEL! Royal Family Hotel is a luxury resort hotel is situated on a stretch of My Khe Beach - one of the six most beautiful beaches of the planet by Forbes magazine. Only a few minutes walk to the sea - cool waves with white sand stretches attract in the eyes of the traveler. With modern design combined with classic lines increases charm for coastal property. Equipment interior and exterior formal and polite. Standard Double Room of us will bring you not only accommodation but also relaxing. You can enjoy the quiet and warm atmosphere in here. After a long trip, you can't wait any longer to be resting on the our soft bed and clean. 1. The above rates are quoted in VND per room and inclusive of 5% service charge and 10% VAT. ​With modern design combined with classic lines increases charm for coastal property. Equipment interior and exterior formal and polite. Twin City Room of us will bring you not only accommodation but also relaxing. You can enjoy the quiet and warm atmosphere in here. After a long trip, you can't wait any longer to be resting on the our soft bed and clean. ​With modern design combined with classic lines increases charm for coastal property. Equipment interior and exterior formal and polite. Deluxe Double Room of us will bring you not only accommodation but also relaxing. You can enjoy the quiet and warm atmosphere in here. After a long trip, you can't wait any longer to be resting on the our soft bed and clean. With modern design combined with classic lines increases charm for coastal property. Equipment interior and exterior formal and polite. Superior Triple Room of us will bring you not only accommodation but also relaxing. You can enjoy the quiet and warm atmosphere in here. After a long trip, you can't wait any longer to be resting on the our soft bed and clean. With modern design combined with classic lines increases charm for coastal property. Equipment interior and exterior formal and polite. Deluxe Family Triple Room of us will bring you not only accommodation but also relaxing. You can enjoy the quiet and warm atmosphere in here. After a long trip, you can't wait any longer to be resting on the our soft bed and clean. With modern design combined with classic lines increases charm for coastal property. Equipment interior and exterior formal and polite. Family Room of us will bring you not only accommodation but also relaxing. You can enjoy the quiet and warm atmosphere in here. After a long trip, you can't wait any longer to be resting on the our soft bed and clean. ​With modern design combined with classic lines increases charm for coastal property. Equipment interior and exterior formal and polite. Royal Ocean View Room of us will bring you not only accommodation but also relaxing. You can enjoy the quiet and warm atmosphere in here. After a long trip, you can't wait any longer to be resting on the our soft bed and clean. Royal Family Hotel is a luxury resort hotel is situated on a stretch of My Khe Beach - one of the six most beautiful beaches of the planet by Forbes magazine. Only a few minutes walk to the sea - cool waves with white sand stretches attract in the eyes of the traveler. 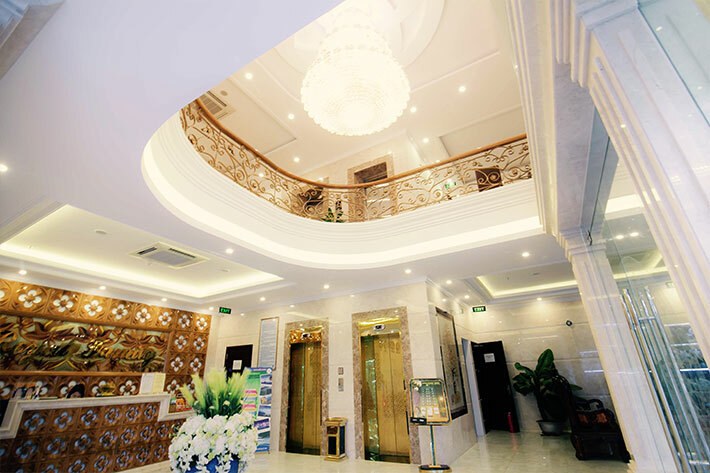 Boasting a convenient location, Royal Family Hotel, located on the Vo Van Kiet street connect to the city center by the Da Nang Rong Bridge only 5 minutes by car. Distance from Royal Family Hotel to the Da Nang International Airport is 3 km, so travelers certainly will be save travel time. To the south is the ideal place for visitors with Monkey Mountain resorts such as Bai But, Bai Rang ... or Linh Ung Pagoda. Northern long-distance Ba Na - Suoi Mo resort about 30 km and the west of Ngu Hanh Son Mountains and Hoi An town. Beside that the famous tourist places such as My Son, Cu Lao Cham, Hue City ...This definitely will give guests a fun holiday. With 11 floors include 48 rooms, a restaurant with a seating capacity of 100 people, the Royal Family is a modern design combined with classic lines increase charming for hotel. Equipment interior and exterior formal and polite. Service restaurant system and hotel amenities, hope to bring comfort to those moments during your holiday per visitor. Visitors are served by experience staff, dynamic, trained professionaly is always express service style thoughtful, considerate and polite surely to please guests. Royal Family have said it all, guests will feel warm and comfortable as you are being at your house. Hotels hopes will become a wonderful hotel when you come to Da Nang - the most liveable city in Vietnam. 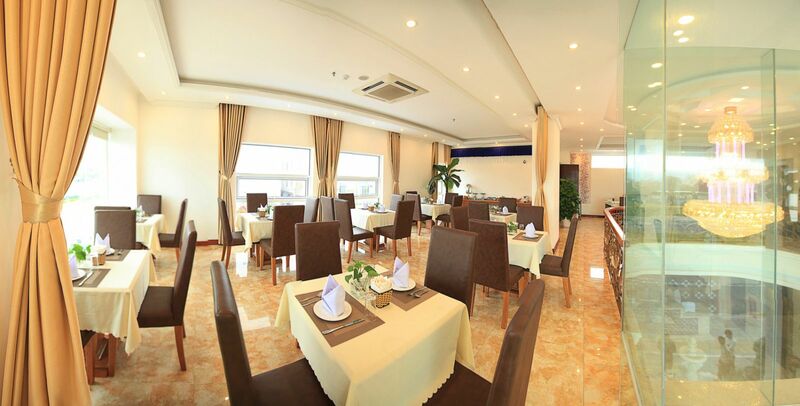 Restaurant Royal Hotel can accommodate 100 guests, serving diverse European and Asian food, seafood, prepared by skilled chefs. Luxurious style with experienced staff, dynamic, well-trained professionaly always express service style thoughtful, considerate and polite sure to bring customers satisfaction with the requirements when using our services. Especially Hotels with preferred price for groups, conference guests.